I was rather excited to receive Cherie Priest’s Dreadnought after enjoying immensely both Boneshaker and Clementine in the past year. I was not disappointed. 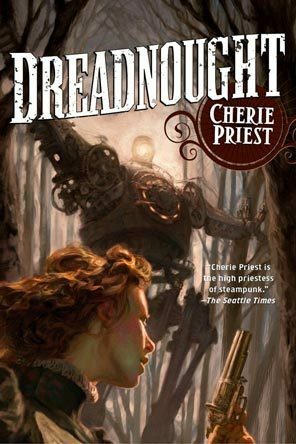 We’re immediately immersed into the culture and atmosphere of civil war USA, with Cherie Priest’s unique overtones of steampunk, zombies, and wondrous mechanical contraptions. The manners and the speech are mid-nineteenth-century America, but the story is out of this world.